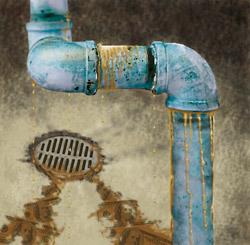 Asset Management Journal by a Reliability Professional: Oil Leakage: How Much of Your Profit is Going Down the Drain? Oil Leakage: How Much of Your Profit is Going Down the Drain? When it comes to oil leakage, at what point would you say enough is enough - 10 gallons, 100 gallons or 1,000 gallons? I recently started a lubrication process design where the client hadn’t reached the breaking point and was at 56,000 gallons of oil being lost per year due to leakage. When I explained it in terms of dollars lost (literally going down the drain), everyone’s ears perked up. It was a staggering sum. They had become complacent. It started as a small amount and grew week after week until they now have to bring in totes daily to set next to the trouble actors so they can feed them like an addict needing more and more. As with every article I write, I like to consult the massive amount of material that is kept on subjects in Noria’s library. Thumbing through the files designated “leakage” could have consumed days on end. I found folder after folder of material dating back well more than half a century. I decided to read one of the oldest I could find, and it read as if it were written yesterday. Why do these problems still persist today? There have been great advancements in fittings, hoses, seals, etc., yet just last week I found myself almost wading through the basement of a steel mill. While touring various plants, I am always amazed at how complacent they can become to leaks. I’m not sure they even realize the effects these leaks are having on their equipment, the environment and the morale and safety of the employees. The following list does not include all of the possible root causes of a failure, but it does encompass the majority of the top contributors. Over-tightening can lead to structural damage of the fittings. Under-tightening will result in improper sealing. Hoses that are too long or in a hazardous environment have a higher likelihood of being damaged. Large temperature swings can cause fittings to loosen over time. Process waste and debris can eventually contribute to leakage. High levels of particulate ingression can promote leakage. Natural weather elements and sunlight can degrade seals. Contamination causes premature degradation of surfaces and seals. An external leak not only will allow lubricant to exit the system but may also allow contaminants to enter. Excessive vibration can cause fittings and hoses to become loose and experience premature wear. Hose abrasion is one of the most common causes of hose failure. Loss of production, poor machine performance, environmental hazards, safety risks and high consumption costs all result from leakage and should be very important to the operation of any plant, yet I usually choose to investigate only one of these factors, as it is the one that seems to garner the most attention - cost. Keep in mind that the money saved from a fixed oil leak goes directly to the bottom line. Inevitably, when discussing cost, the client wants to do a simple calculation based on the number of drops per second or minute vs. the cost of the oil. I will let them run through the calculation and arrive at a value. After we ponder the loss for a second, I will then ask, “What about the labor?” Don’t forget the benefits, management, planning, paperwork, etc. That’s not all. Used oil disposal, new oil testing, safety costs, cleanup, purchasing ... I could go on and on. I prefer to take a preventive approach. First, develop a strategic plan that is both proactive and preventive. One of the easiest ways is to perform regular inspections with associated action items that are dependent upon the results of the inspections. The second step is to control the operational conditions as best as possible. This is fundamental to any reliability and lubrication program, but simply keeping the machines and fluid clean, cool and dry will help mitigate the leakage. Next, implement a detection and control program. Some popular leakage-detection techniques include visual inspections, dye injections/black light, system pressure decay, pressure differential, ultrasonics and flow meters. Finally, you must exercise proper contamination control. This not only will help with leaks but also will offer huge improvements in machine reliability. It is estimated that more than 100 million gallons of fluid leak from machines every year in North America. How much are you contributing to this number? At nearly every plant I’ve visited recently, I can calculate enough money lost to employ an entire team of technicians whose sole purpose is to identify and stop leaks. Down the drain are going hundreds of thousands of dollars that could have been added directly to the bottom line. So the next time you walk by that small puddle on the floor or that drip from a fitting, I want you to see dollar signs.